I Get it from My MAMA! Some of my fondest memories as a little girl include watching my mother get dressed up for events. While she prepared for her outings, I would sit at the edge of her bed and study her. I asked several questions about what she was wearing and where she was going. Her outfits were always classy with a touch of sass, and her jewelry consisted of gold, diamonds and pearls every now and then. She kept her makeup to a minimum, she always had a small, dainty purse to accommodate each look, and she completed every outfit with a spray of White Diamonds or Chanel No. 5 perfume. On occasions my mother would get me all dressed up as well, comb my hair into an elegant bun or French roll, give me a little dainty purse of my own to carry, and take me to the Ebony Fashion Fair runway shows. This was my first exposure to high-end fashion. I was in awe. Attending these shows and observing my mother's love for fashion ignited a style beast inside of me. I knew at a young age that fashion would definitely be my outlet through which I express my art. As a result of my style exposure, I started feeding my fashion addiction very early. Emulating my mother’s style, I would dress up in her slips, nightgowns, socks and heels. I chose her slips and nightgowns because they seemed easier to tailor to my little body (great fashion sense for a style amateur huh?!). I would add a belt around my waist to make sure the outfit would fit as perfect as possible, and then I would politely pose for pictures. Style plays a huge role in my family. My mother and her sisters are the first people I have ever seen turn up the collars on their shirts and jackets. I took this style technique from them and incorporated it in my looks that include jackets with collars. Check my mother, aunts, and grandmother out below. My mother is in the black and white, my grandmother is in the front with her head turned to the side, and my aunts are surrounding them. Excuse my brother and his photo bombing antics. I love that my mother understands the need to have several pairs of shoes and a few different closets full of clothes. This, among many reasons, is why we connect! When I call her about an outfit or a pair shoes I want that I know I don't need, her usual response is "Buy it Sam." Man...isn't my mother the bomb?!! 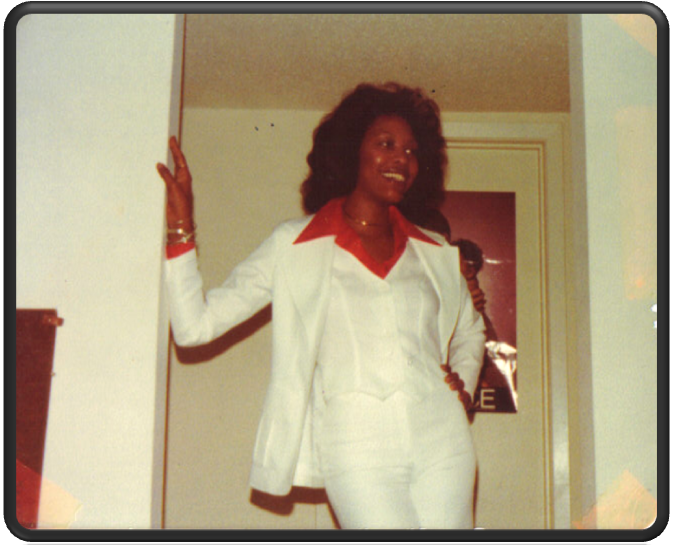 Check out some more stylish pictures of my mother below to see why I get it from my Mama! Above my mother is pictured with one of her favorite poets, Dr. Maya Angelou. In this picture she is wrapped in her fur coat looking very "Manhattan 5th Avenue." I need that coat Ma! Here she is pictured with my grandmother in her silk suit. My mother loves silk, rayon and leather. Her style advice to me is to always purchase quality fabrics that will last. Above is my favorite cocktail dress that my mother owns. Reasons being, it's my go-to color combination (black and white) and it's timeless. She has had it for double digit years, and it steals the show ‘til this day. I love my mother dearly for encouraging me to express myself through style. She taught me that carrying yourself in a positive way makes you even more stylish. I thank God I have great women in my life like my mother, aunts, and grandmother influencing not only my style but my character as well. I will definitely take a lot of things they taught me on my journey in life, and I will keep our style legacy alive! I love you Big P! Happy Mother's Day!! Happy Mother's Day to all of the mothers out there! What type of style/fashion advice did your mother give you?